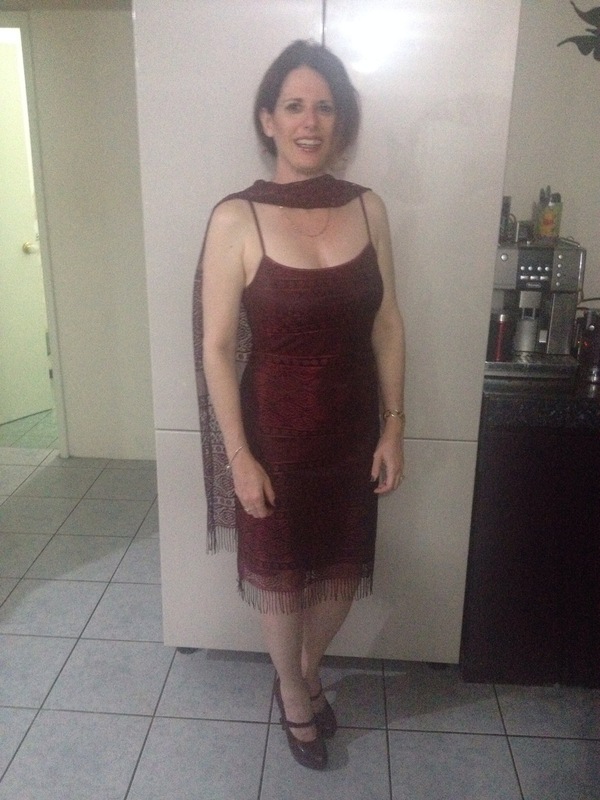 I am doing FROCKTOBER in honour of my Aunty Marg who passed away from ovarian cancer on the 25th September. It’s Friday. Finally. Make that Flapper Friday! It’s Friday. Finally. Make that Flapper Friday. It was going to be Flashback Friday, coz in my endeavours to stick with the theme for this year’s FROCKTOBER, I did find *several* outfits that date waaayyyyy back. Specifically, the dress I wore for my engagement, and my “going away” suit…and since I’ve been married close to twenty five years you might be able to imagine what they look like. 🙂 and while I’m reasonably confident that I could still fit my engagement dress, I suspect I might not get the zips done up on my suit. Anyway, they’re a little scary looking, and no one deserves to see that! So I wussed out. Instead, and still on a wedding theme, I’m wearing the outfit I bought for Raivanswed a couple of years ago. The wedding had an Art Deco themes so I was delighted when I found this dress. I’ve paired the dress with my Shoes of Towering…thankfully I had them on for like two minutes to take the photo and then they were off again, otherwise I suspect I wouldn’t be able to walk tomorrow at the funeral. And I do love it. Just sadly I don’t get to wear it too often. So, yay for FROCKTOBER and an excuse to don it!